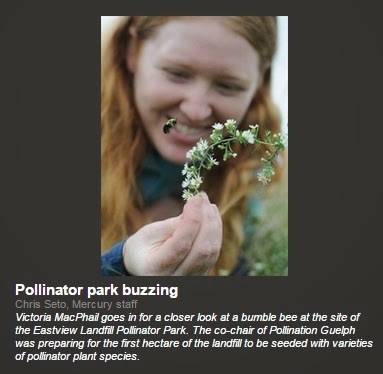 I first blogged about this Pollinator Park project in 2012! Glad to see that it continues to expand! (The) pollinator habitat (is) on the 45ha (112 acre) decommissioned Eastview Landfill site. (It) will be one of the first and largest pollinator initiatives to occur in Ontario, Canada, and internationally. It will also highlight the City of Guelph's commitment to being a leader in environmental initiatives. The Pollinator Park is a long-term, multi-stage project. Work began in the fall of 2012 and the first hectare was seeded in Fall 2013. We plan to seed another two hectares in Fall 2014 and if we can raise the funds, add two hectares a year in future years. A bee hotel was added in June 2014 through the "Wild for Bees" initiative, which Pollination Guelph was a site partner in. This initiative is sponsored by Burt's Bees, Sustainable.TO, Fairmont Hotels & Resorts, and Pollinator Partnership Canada. (The) project had to use the herbicide Roundup to get rid of the fescue grass, a species planted to help prevent soil erosion on the mound. The Eastview Landfill was decommissioned in 2003 after collecting the city's garbage since 1961. For the past 10 years it sat empty, gathering various weeds and invasive plant species. Some flowering species grew out of its clay, rocky soil, but the field hasn't been much of a hot spot for wildlife. 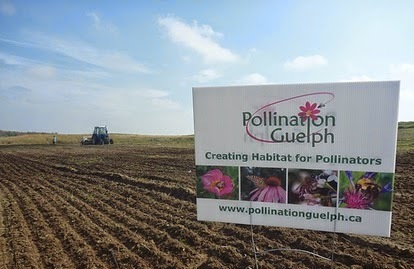 Since 2009, Pollination Guelph has had its eye on this open space as a potential haven for bees, butterflies, birds and native plant species, but it needed to raise enough funds to be able to act on its plan. This year, the charitable organization reached its goal of raising $15,000 – the amount it cost to prep and seed one hectare of land – and was able to sow the seeds of a variety of native species. These species include coneflowers, black-eyed Susans, milkweeds, Indian grass and several others. The first flowers are expected to appear in the fall, with the majority of the bloom occurring in 2015. Elaine Williams, executive director of Wildlife Preservation Canada, said her organization joined up with Pollination Guelph earlier this year. She hopes the pollination park will become a healthy sanctuary for various species at risk, including the meadowlark and the bobolink bird. She said once the park is more established, it may even be a good place to reintroduce the endangered rusty patch bumblebee.